Georgia’s travel industry may be down, but it’s not out. The entire convention and business segment has been hard hit by the recession, especially in Metro Atlanta, and the ongoing tussle over the state flag is making a tough situation tougher. But industry leaders are responding with thoughtful strategies, aggressive marketing and some good deals, bolstered by new convention space at the renovated World Congress Center (WCC) and the soon-open Georgia International Convention Center. Cost-conscious businesses planning conventions in Georgia in the coming months can reap the benefits. That means some current efforts may have a long-term pay-off, rather than an immediate effect. “Down the pipeline, it’s the same as the airlines, and we think it will be 2004 before we see a recovery,” says Richardson. Because hotel rates are 30 to 40 percent lower than those in almost any other major convention destination, Atlanta is already one of the best values in the country. Rates can’t go much lower, so much of the new emphasis is on giving customers more for their money — and promoting the new convention facilities. Richardson is also banking on improvements to downtown Atlanta, and will launch an effort to convince conventioneers to come earlier, stay a day later and bring their spouses. “Atlanta is alive and well, and the best is yet to come,” he says. “With the Children’s Museum, the new Symphony Center, the Aquarium, and Atlantic Station, I think Atlanta will become a great place to spend an escape weekend. I think the Aquarium will give the city its biggest buzz since the Olympics.” The ACVB is working to develop a regional approach to tourism with Nashville and New Orleans, places travelers often reach via Atlanta’s Hartsfield airport. Finally, there will be a concerted effort to encourage Georgia corporations such as Coca-Cola and CNN to hold their conventions at home in 2003 and 2004. “We’ll launch a campaign with local meeting planners and convention centers in other Georgia cities to encourage them to stay in the state,” says Richardson. This way Atlanta can take advantage of a national trend in which businesses are traveling shorter distances and meeting closer to home. 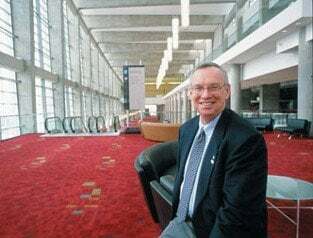 The Atlanta Hotel Council’s Breslin says although Atlanta’s hotel market has not had to reduce rates for conventioneers, new bargains are there to be had during certain less popular dates. “Where we’ve been newly flexible are dates over Thanksgiving, Mother’s Day, July 4, Memorial Day, Christmas week, the first week of the New Year and Labor Day,” he says. Venues run the gamut from Centennial Olympic Park to the High Museum of Art, and the groups also work closely with the Atlanta Sports Council. Atlanta is especially attractive because of its reputation for sports, says Breslin. “We’re the sports capital of the world, when you think about it,” he says. This teamwork approach is all the more important as Atlanta continues to expand into surrounding communities. Breslin notes there are 35 different hotels represented in the council. Add in sister associations in Buckhead and South Fulton, and the number triples. Richardson says convention centers like Cobb County’s Galleria and the Arena at Gwinnett Center further enhance the region’s ability to accommodate multiple convention groups at the same time. The ideal scenario for the newly expanded WCC, says Wellington, is to have three conventions at once — one moving out, one coming in and one ongoing. This is the key to filling Atlanta’s hotel rooms and driving up the occupancy rate. If a company must have lower rates, so-called “second-tier” cities are always an option. Savannah cashed in on that market with its three-year-old Savannah International Trade and Convention Center (SITCC). Located across from River Street and adjacent to the Westin Harbor Resort and Spa (which includes the 18-hole Club at Savannah Harbor), the 365,000-square-foot SITCC can accommodate more than 1,500 conventioneers. Business has been brisk since it opened. “This year will be the best we’ve ever had,” says J. Dirke Von Hollen, vice president of sales for the Savannah Convention and Visitors Bureau. “The key will be getting attendees to show up.” Like the WCC, the SITCC has initiated a dialogue among area hotel managers and businesses to create package rates for convention planners and help boost business throughout the city — already adept at attracting tourists — in a similarly teamwork-oriented approach.